Released in Japan as a licensed game based on “Fist of the North Star,” Last Battle is the weakest link in the Sega Genesis launch line-up. A side-scrolling punch-and-kick action game, it’s similarity and inferiority to Altered Beast leave it out in the cold. The game has some sort of plot, but the introductory text scrolls by so fast that no normal human can read it, and it really sets the tone for how much I care about subsequent plot elements which come in the form of interactions with NPCs at the end of most levels. Last Battle is a much longer game than Altered Beast, and features an overworld map that allows you to choose your own path through each of the game’s 4 chapters. As you defeat enemies, you have a power meter that slowly fills. Once it’s full, you are given a power boost that lasts for the rest of that stage, but they process takes entirely too long to be useful. 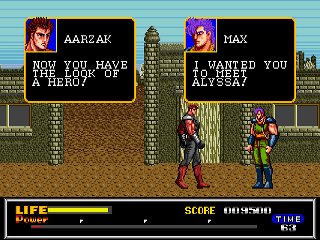 Your character, Aarzak, has a life bar which incrementally depletes as he is hit, but is replenished in small quantities every time he defeats an enemy. This system is used in lieu of one-hit deaths, and you only have one life and no continues. This can be problematic as choosing stages in the wrong order can get you into situations that you are not ready to face. Some of the stages are presented as a 2D side-scrolling maze requiring you to figure out the proper path to take. These stages are free of enemies, but instead feature other forms of death-dealing obstacles, like rocks raining down from the ceiling or spinning axes floating through the air. While some people (especially those that bought this game at launch) can probably convince themselves that this is a decent early Genesis release, you will be missing out on nothing by skipping it entirely. Buy Last Battle on GameGavel or Amazon. Tagged Action, genesis, Last Battle, launch, Review, sega. Bookmark the permalink.